Representative from Ministry of Foreign Affairs of Nepal, Mr. Pratik Karki, delivering his speech in the event. On August 17th, 2018 the United Nations Regional Centre for Peace and Disarmament in Asia and the Pacific (UNRCPD) held an event on peace and disarmament education (PDE). The event also marked the occasion of UNRCPD’s 10th anniversary of operations in Nepal and celebrated the International Day of Youth. 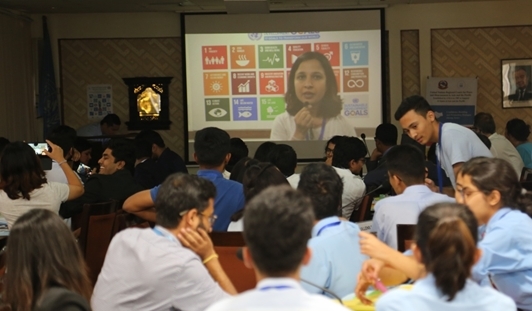 Held at the UN House in Kathmandu, Nepal; 3 high schools, 4 university colleges, 3 youth organizations alongside officials from the Ministry of Foreign Affairs, the Ministry of Education, Science and Technology, the Ministry of Youth and Sports, and representatives from United Nations Resident Coordinators’ office, UNDP, UN WOMEN, UNESCO and UNFPA, discussed creating safe spaces for youth through peace and disarmament education. UNRCPD presented the UN Secretary-General’s Agenda for Disarmament, Securing Our Common Future and the publication entitled Action for Disarmament: 10 Things You Can Do! which was followed by creative discussions and activities on what peace and disarmament means to youth and what they can do to actively engage in meaningful ways for their communities, country and region. The youth had a chance to analyze and talk about the three priorities of the Secretary-General’s Agenda – disarmament to save humanity; disarmament that saves lives; and disarmament for future generations — and the interdependence between disarmament and sustainable development. They recognized that understanding disarmament in relation to the 2030 Agenda for Sustainable Development was key in breaking down complex ideas of disarmament into tangible, achievable targets for youth participants. They also highlighted the gender dimension of disarmament and the importance of the equal, full and effective participation of women in all decision-making processes related to disarmament, and emphasized peace and disarmament education and broader engagement of youth in activities related to peace and security. Students reflected on how the Disarmament Agenda relates to them through lively discussions on what makes them feel secure; what role they have in peace, disarmament and arms control; and what they need to have maximum impact for peace and disarmament. This was followed by creative presentations from each high school and university regarding Action 4 from 10 Things You Can Do!, “Express Yourself”, where youth creatively shared the importance of peace and disarmament. The students showcased their ideas through skits, presentations and videos on peace and disarmament. Participants stated that they feel secure in a safe, non-violent environment which protects their emotional, mental and spiritual well-being. They highlighted the importance of community bonding through dialogues on tolerance and inclusion. Freedom of speech and expression with access to education and information also contributed to their sense of security. 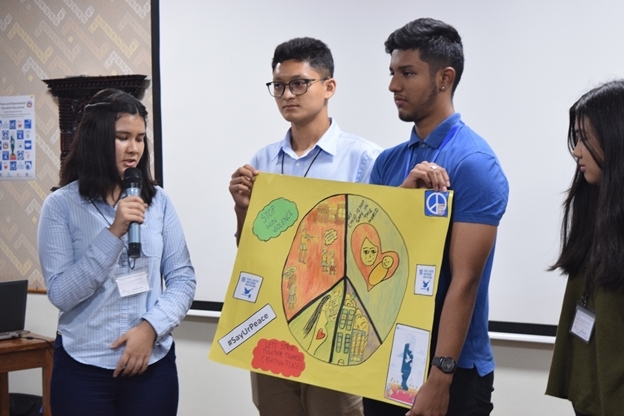 The participants underscored the need for youth to actively educate themselves on peace and disarmament issues, including enhancing dialogues around non-violence, building knowledge on alternative dispute resolution and understanding and identifying mental health issues. Youth agreed that disarmament discussions need to be disseminated to local levels. They also stated that they themselves can lead by example to motivate others and help change the mindset of other youth to be vigilant against violence. Youth emphasized the importance of having access to quality education, which includes subjects such as peace, global citizenship and disarmament education in order to advance the disarmament agenda alongside the sustainable development goals. They pointed out that there needs to be more peace and disarmament training opportunities for youth and a need for financial resources allocated to PDE programmes, activities and innovations. 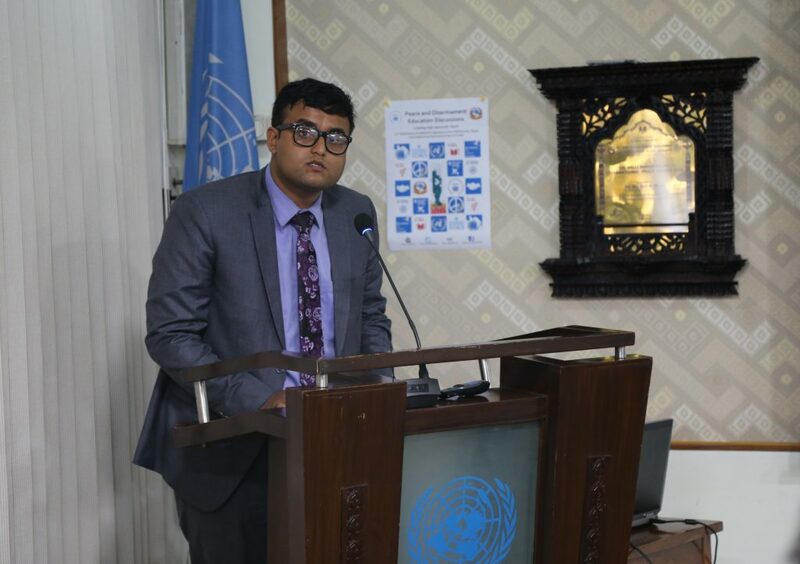 Youth remarked on the need for safe spaces to engage in disarmament advocacy activities both through youth forums and networks and through social media, calling on social media companies and governments to protect online spaces in relation to hate speech and cyberbullying. Like the Secretary-General’s Disarmament Agenda, youth participants placed importance on the need for strong partnerships. This included both unity among youth, between youth and society and between youth and government. Participants pointed out that youth must work with the government to support its work on disarmament and arms control and promote the implementation of Security Council resolution 2250 (2015) – which urges Member States to increase the representation of youth in decision-making – by developing national plans of action that envisages youth’s role in disarmament. 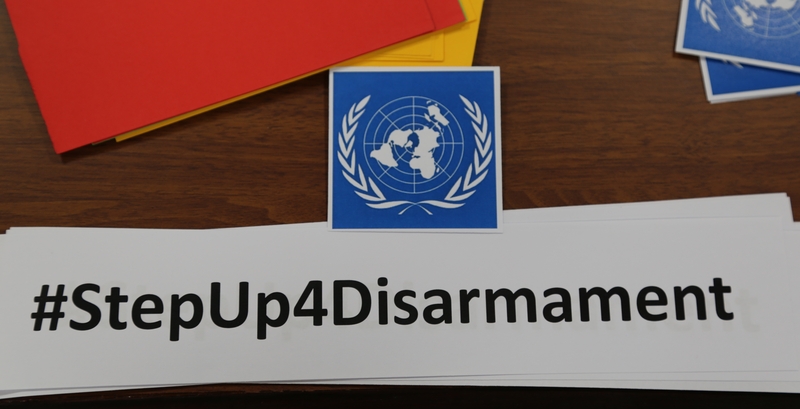 For more information, contact Ms. Jane E Lawson, Regional Peace and Disarmament Education Project Coordinator at UNRCPD by e-mail: info@unrcpd.org. More pictures of this event are available at the UNRCPD website, and on flickr .